I am starting a new weekly article series called, “Healthy In A Hurry.” If you’re looking for inspiration for new recipes that are good for you and also don’t take a long time to prepare, this is for you! Most Healthy In A Hurry posts will be one full dinner menu, complete with an entree and all your sides, and I will also sometimes include suggestions and ideas that you can integrate into your current cooking style to increase the health factor in what you’re serving. I hope you’ll enjoy trying new dishes and learning with me! 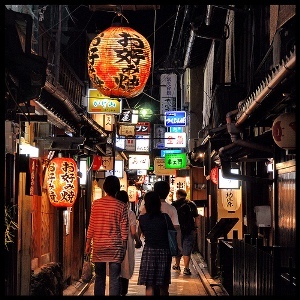 If you are familiar with Japanese cuisine at all, you know there is a lot more to it than sushi. 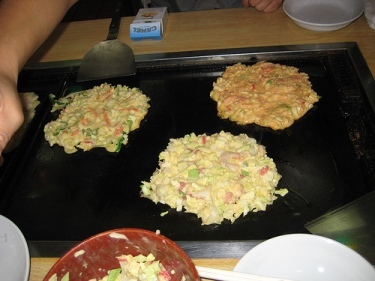 Okonomiyaki is a pancake-like dish that has countless different varieties. You can start with the basic batter, and then add whatever combination of meat, seafood, vegetables, and spices you like. It’s very easy to make and tastes great, but what I like best about it is that it’s a great dish for sneaking in a lot of vegetables. The picky eaters in your family will barely notice! The recipe below is the one I use. I love the flavor combination, but feel free to mix and match whatever ingredients work for you and your family. 1. In a large bowl, mix shrimp, cabbage, green onions, zucchini, and bean sprouts. 2. In a separate bowl, beat together eggs, Bisquick, broth, and soy sauce. 3. Pour batter over shrimp mixture and toss thoroughly to coat. 4. Use non-stick spray or 1/4 tsp. sesame oil on pans over medium heat. Pour 1/4 cup batter into pan, cover and cook for four minutes. Turn over, and cook for four more minutes. You will need a little sauce for these. I like to make my own by mixing a little Worcestershire sauce into some Trader Joe’s organic ketchup. You can also buy some bottled sauces, but just be careful because many of the sweet ones are high in sugar, and others are high in sodium. You can get really creative with this recipe, so have fun! I hope this inspires you to try something new (and healthy!) tonight! Let me know if you give it a go, and I’d especially love to hear about the variations you create! Happy healthy eating!